Metro has 2 Spray Foam Insulation Rigs to Serve Your Needs Quickly. Provides an more effective air and moisture barrier. Adds additional structural integrity to walls, floors, and ceilings. Reduces the amount of pollen can come into the home which helps improve indoor air quality. Will remain effective even if it gets wet. Why is Spray Foam Insulation the Best? High R-Value per inch provides enhanced thermal performance to minimize hot and cold spots. Its rigid structure provides added structural integrity to your walls and floors. It acts as a secondary moisture vapor barrier to help reduce the risk of moisture penetration into your home or office building. If you are concerned about the extra costs of spray foam insulation, don’t worry because the benefits make up for the extra costs. Also, you can use spray foam insulation in combination with other types of insulation like fiberglass and cellulose for reduced costs. Metro Garage Doors is pleased to offer spray foam insulation for the metro Atlanta area. Spray Foam Insulation is known for its generous coverage, spray foam forms an excellent overall air barrier. Spray foam is customized onsite to fit constructed walls, ceilings, floors, and attics. It is fire and moisture resistant and keeps pollutants, allergens and pests out. Spray foam insulation can be used on walls, ceilings & even crawlspaces. Spray polyurethane foam (SPF) insulation is a category of high-performance spray foam insulation and air barrier material that delivers multiple benefits in one application. These advantages include high insulation values, near-zero air permeability, increased building strength, severe weather and flood resistance, increased occupant comfort, improved indoor air quality, reduced operating costs and lower environmental impacts. 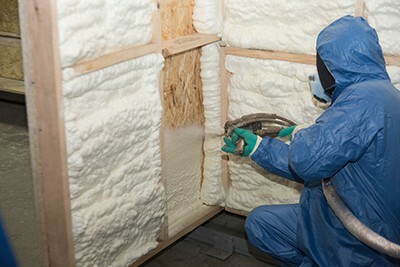 You can read complete benefits of spray foam insulation on the BASF website. Metro has been diligent in learning all we can about the spray foam insulation business and the application process. We have taken our time and trained our installers on how to protect both themselves and the homeowners when installing. We look forward to installing YOUR spray foam project. You can also contact us online.